Now you are slowly approaching the summer months in Europe and as well as being the perfect month to visit a number of destinations in South America. It is also a time of year the flowers start to spring turning landscapes into a sea of colour. April is the perfect time to experience a very unique occurrence known as Hanami – in which the Japanese cherry blossoms turn full bloom making for a beautiful sight. These blossoms are usually expected around late March so start coming into there beautiful best around April time. In the capital city Tokyo you may be expecting mammoth skyscrapers and a hustling city life in which this city is famous for however April brings a whole new form of beauty to this incredible city with the Cherry Blossoms in full show bringing a whole new dimension to the city, with a number of picnic spots under the trees with amazing views of the city relax and have picnic before heading to the ever expanding and ever buzzing city centre of Tokyo. Head south to the sub tropical islands of Okinawa and experience a whole new aspect of Japan with its natural beauty combined with the blossoming trees these island really come into their own during this time of the year. These islands are famous for its wide beaches and coral reefs and broad rainforests ready for you to explore the Japanese wilderness. The old capital of Japan, Kyoto is a hugely historic town as it was where the emperor resided from 794 to 1868. It is home to a large number of temples and shrines with hugely historical relevance such as the Fushimi Inari Shrine which is set up in the sacred Mount Inari on the outskirts of the city. As well as this Kyoto is home to the Tofukuji Temple which is set around a forrest which again around this time of the year blossoms into a spectacular show of colours. 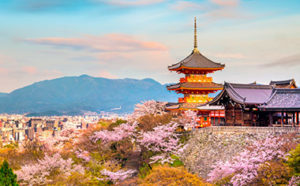 We work with a number of amazing tour operators of whom can provide a memorable tour to see the cherry blossoms such as Wendy Wu Tours – discover their ‘Partner Flies for Free’ deal. April is the perfect month to visit India thanks to the much cooler and bearable temperatures than the rest of the year. Along with the better weather there are also a number of other advantages for travelling during this month, tiger sightings are much more common in the national parks scattered all around this majestic country as they come out looking for water. 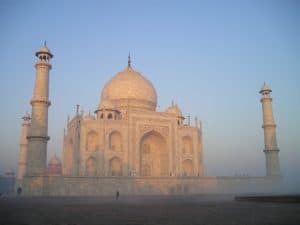 Of course you cannot visit India without marvelling at the world famous Taj Mahal the beautiful ivory-white marble mausoleum on the south bank of the Yamuna river in the Indian city of Agra – it is simply a must see. Kerala is a region in the south west of the country and is often associated with luxury holidays to India thanks to its many beautiful beaches and this is indeed a great place for a relaxing retreat away from the hustle and bustle and a chance to enjoy the water of the Indian Ocean. Visit during this time of the year to avoid the heavy rainfall that this area experiences in the wet season and head out on an adventure like no other as you sail through the wetlands in awe at the nature around you. India has always been on the dedicated tourists trail but over the last few decades, as travel has been made easier and more efficient, escorted tours to India are becoming more and more popular. In terms of size, it’s the seventh largest country on the planet and in terms of population it is second only to China. So don’t hesitate to contact us and we can start to piece together the perfect India holiday for you to book now! April is a brilliant month to travel to the Netherlands, the weather starts to feel less like winter, the days get longer and the Dutch come out on their bicycles. It is also the month in which rows and rows of tulips come out to create fields of colour all over the Dutch country side. Amsterdam is the main attraction when it comes to the Netherlands you can understand why. Home to a rich history of art with famous museums at every end of the city you’ll be sure to get a good helping of culture. Visit the Rijskmuseum which is along side the Van Gogh museum both home to some of the very best art the world has to offer, with a number of smaller museums all show casing a wide variation of displays – a personal favourite is the historic Anne Franks house. Rent a bike and navigate the cities cycle lanes which meander along side the very elaborate canal system that it is renown for. Head to the Keukenhof Gardens for some incredible flower displays as they all blossom for the up and coming summer. You can also expect some King’s Day celebrations during this month so pack your best orange outfit! Now if you are visiting for the tulips then we have a number of tours in which are dedicated to visiting the best possible spots for these incredible colourful fields full of all different flowers. Kuekenhof is the biggest flower park in the world and lies between Amsterdam and the Hague and is home to a collection of tulips, roses, orchids and many more weird and wonderful plants all combining to create an explosion of colour. The most popular method of seeing all this with our customers is on one of our tulips cruises in which encounter windmills and beautiful country side as you cruise through Europe.